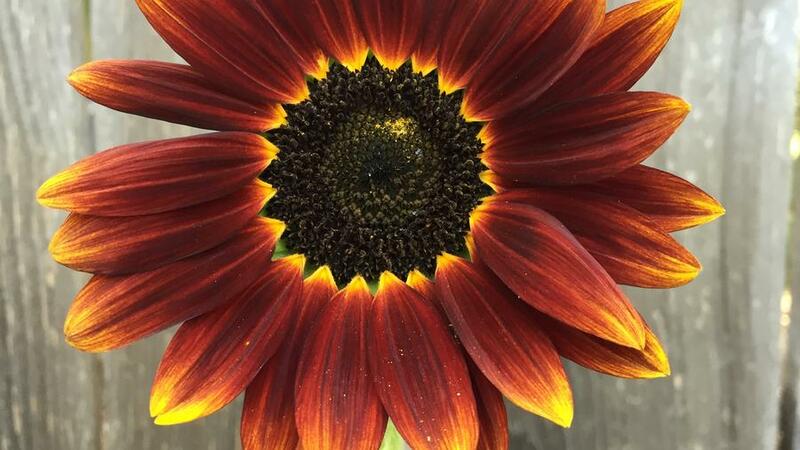 We caught up with Stephanie Pressler of Opa’s Garden and she shared her top picks for easy-care sunflowers. Take a look at this sumptuous autumn color palette and you may well be tempted to turn your backyard into a sunflower forest—read on to learn how! “We have been growing sunflowers in Opa’s Garden for the last few summers, and each year I am amazed by the diverse array of sizes and colors. This summer, we decided to let the sunflowers take over the entire large raised bed and grow as they pleased. We ended up with a small sunflower forest. There are several volunteer sunflowers that started themselves from seeds that fell last year, as well as a wide variety of seeds that we planted. As their name indicates, sunflowers love full sun. Once the seeds are started they require little water, so they are bright and sunny flower options that are drought tolerant. The many colors and size varieties of sunflowers make them one of my favorites for summer gardens. ‘Moonshadow’ sunflowers have dark centers and light, buttery yellow petals. They will grow as multi-branching stalks with many flowers that have 3-5 inch diameters. ‘Royal Flush’ sunflowers have vibrant bicolored petals, which often range from rich or rusty reds at the inside to golden or lemony yellow at the tips. They bloom early in the season and are a great cutting flower for indoor bouquets. ‘Van Gogh’ sunflowers have the classic colors of the artist’s famous paintings. The flowers grow from a strong single stem and have sunny yellow petals with tan and golden rings around a light green center. ‘Strawberry Blonde’ sunflowers have dark burgundy petals that turn light yellow at the tips and dark centers. Curious what to do with a sunflowers after they bloom? Here’s a great idea from Stephanie. Follow Opa’s Garden for an inside look at gardening in Northern California, including tips on how to grow your own vegetables and herbs.